Today’s challenge was thought up by Rachel from A Dress is for Life and the theme is “Standing Out From The Crowd”. For this post I decided to share with you my quest into brighter and bolder prints, charting how I became to be more adventurous. This first dress I bought over a year ago. I loved the shape of the dress and I am a sucker for anything coral. Now, I say I bought the dress over a year ago, but the picture below, taken in May of this year was the first time I wore it. Because before, I was too scared. I tried to wear it on numerous occasions previously, but it was so far out of my black comfort zone that I felt like I was wearing a flashing neon sign saying “Look! Fat girl!” Now I wear it and enjoy wearing it. Looking back, I can’t believe how scared I was, simply to wear a pretty dress that wasn’t black. The next dress I am showing you is one that truly does stand out from the crowd. This dress has a beautiful flower print and is quite unusual. 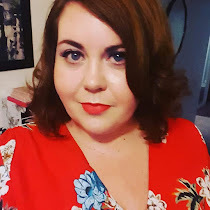 I wore this on a trip out to Manchester with the girls for cocktails and it definately stood out from the crowd, for the right reasons! I was so nervous about wearing this dress, but I loved it so much that I had to wear it, even teaming it with a red cardigan for an extra pop. My next standing out from the crowd dress I am not showing here, but will be wearing at the after party of Plus North. I wanted something that exuded confidence and for me, that had to be a bright red dress. My final goal. Check out the other lovely ladies to see what they have chosen to stand out from the crowd. Thanks Nikki! I love colour and print so much these days. I absolutely love red, it makes me feel confident when I wear it. Both dresses are cute, but I REALLY love the first one. I'm a sucker for coral. I really love coral too, can never resist it!